This vast sculpture depicts Peace standing on a four-horse chariot, driven by a young boy. It is 12 metres high and 13 metres long, and was the largest public sculpture in Britain until the erection of Antony Gormley’s Angel of the North. The history of the Quadriga is a complex, tortuous tale of false starts, political manoeuvring, apathy, public outcry and ultimately, lack of appreciation for the sculptor Adrian Jones who produced the monument we admire today. Adrian Jones (1845 - 1938) was an English sculptor and painter who specialised in animals, particularly horses. He was born in Ludlow, Shropshire and initially studied at the Royal Veterinary College; he subsequently joined the army as a veterinary officer, attaining the rank of Captain. It was after leaving the army in 1890 that he embarked on his artistic career. This sculpture of Peace in her Quadriga is probably his best known work. 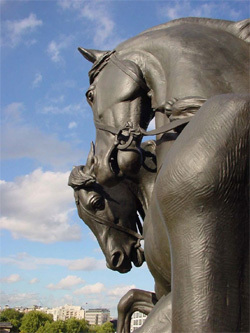 There are several other sculptures by him in London; works to be seen elsewhere include Duncan's Horses, currently at the Royal Veterinary College, and the Boer War memorial at Adelaide, Australia. His bronze of Redvers Henry Buller astride his war horse was erected in Exeter in 1905. Our conservation, which took place in 2000, included the repair and replacement of the corroded support structure, full cleaning, repatination and waxing. The bronze casting was supported by its original, complex steel and iron armature, which had corroded badly. Some elements of the armature had corroded away completely, while other parts of the structure were being distorted and weakened by rust jacking. By contrast, the fabric and the structure of the bronze was found to be very good showing little sign of casting faults, porosity or poor craftsmanship, a testimony to the Thames Ditton Foundry who cast it. The surface of the bronze however displayed copper carbonate (green) corrosion at all points where the old lanolin/wax coating had failed, a result of poor maintenance. Underside surfaces showed more severe pit corrosion. In some areas of excessive surface coating, detail was almost obliterated from view by the shear thickness of the lanolin/wax and dirt. The approach to the conservation was one of a balance between restoring the original visual aesthetic of the piece, while striving for a minimum intervention policy where at all possible. Cleaning of the structural steelwork began using a low-pressure air abrasive system with garnet blasting sand. On completion of blasting, a primer was applied to all exposed surfaces. At this point the damage to the structural support could be assessed and a program for removal and replacement was established and carried out. Cleaning tests were carried out to the bronze to establish the most appropriate method. It was considered prudent and more ethical in conservation terms, to first steam clean the surface of the bronze. 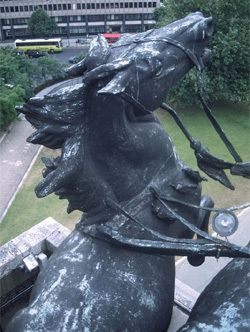 Having achieved a surface suitable to repatinate over on 90% of the sculpture by the steam cleaning process, further test were carried out and the remaining old black lanolin/wax was then selectively cleaned using a low-pressure air abrasive system. After cleaning it was evident that overall the structure was in very good condition. Repairs were carried out to a few problem areas. During the cleaning process, areas that had been protected by the black lanolin/wax were revealed to have evidence of the original dark brown patina. It was therefore decided that the patination should be carried out to attempt to reinstate this colour over the whole of the sculpture. Tests were carried out and an agreed colour was established. Patination to the agreed colour was successfully carried out using traditional methods. Once the dry colour had been achieved over the sculpture, it was waxed using a clear microcrystalline wax, applied to a warmed surface. Once this was achieved all over the bronze surface three more cold coats of clear wax were applied to build up a substantial protective layer. Each cold coat of wax was applied and left for at least an hour to harden and then buffed by hand to compact its surface. On the fourth and final coat of wax the buffing was confined to highlighting only. Hard wax filling was then carried out to all areas of minor surface flaws (porosity, cracking, hairline cracks at junctions), and to a few larger flawed areas, to eliminate water traps. The wax is applied in a softened state and then burnished to complete the surface form. Bird mesh protection was then installed. 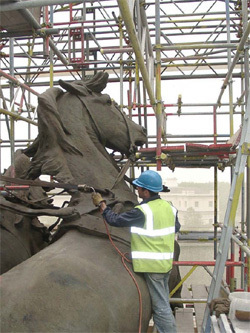 Several moulds were taken from parts of the sculpture and cold cast bronze copies were produced for the purpose of illustrating the vast scale of the bronze at the Visitors’ Centre in the Wellington Arch. All the areas moulded were washed and rewaxed after this process had taken place to ensure the protective coating had not been depleted in any way. Finally the bronze dedication plaque to Adrian Jones was restored. 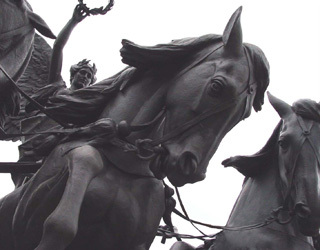 The history of the Wellington Arch, the Quadriga and the various tributes to Wellington in London is a complex, tortuous tale of false starts, political manoeuvring, apathy, public outcry and ultimately, lack of appreciation for the sculptor Adrian Jones who produced the sculpture that we admire today. From the mid-eighteenth century, plans were made for a grand western entrance to London via Buckingham Palace, and Hyde Park corner was thought to be an appropriate site. Eventually, in 1778 Robert Adam produced designs - but nothing was done. The proposal was revived after the Napoleonic Wars and in 1825 Sir John Soane produced a master plan of a series of arches, defining a royal processional route – but the schemes were not commissioned. A year earlier, in 1824 Decimus Burton had been engaged to design a series of new lodges for Hyde Park, and in 1825 he submitted designs for new park entrances. In 1826 he produced further designs, including a Quadriga bronze on the roof of a great arch, and by spring 1828 the carcass of this arch was built. George IV died in 1830, and his successor William IV showed little interest in the arch, and it became demoted from a grand entrance to Buckingham Palace to merely an entrance to Green Park. Before long an influential group of people decided to foist a new purpose upon it - as the national memorial to the great hero of the age, the First Duke of Wellington. In 1838 a life sized equestrian statue by Sir Francis Chantrey was erected to Wellington outside the Royal Exchange in the City (where it still stands). 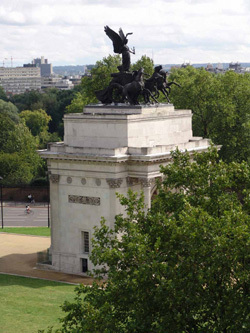 Further money was then raised for another monument to Wellington to be erected near Apsley House (at Hyde Park Corner), and it was decided that the summit of the arch would be the most appropriate site. Matthew Cotes Wyatt was proposed to be the sculptor (he had sculpted the equestrian statue of George III on Cockspur Street). However, Cotes Wyatt was not popular and a great public row took place through the newspapers. Undaunted, Wyatt designed a colossal equestrian statue of Wellington for the arch. Decimus Burton appealed against it but lost his fight, and had to alter and strengthen the arch to take Wyatt’s vast sculpture, beginning in 1845. The 27’ high statue was erected in 1847 on the arch, first of all for a three-week public trial. The public hated it and ridiculed the sculpture, but Cotes Wyatt’s supporters dug their heels in and it stayed. To rub salt into the wound, Decimus Burton was never paid for altering his arch to take it, and when he died in 1881, he left the Government £2000 in his will for the removal of the statue. In 1883 it was decided to move the arch to relieve traffic congestion, and to enable this the statue had to be removed. This old postcard shows the arch in its new position, but not yet bearing a new sculpture. Most people who originally objected to the statue were dead by now but it still aroused strong feelings. A committee was appointed to make decisions about the future of the monument, and they recommended melting it down and erecting a smaller version at Hyde Park Corner. The army objected to this drastic action, and so the sculpture was moved to Aldershot, near the Garrison Church, where it still stands. (For many years in the late twentieth century it was neglected, obscured by trees, however in 2003 we restored the vast bronze). Edward Boehm was commissioned to produce a new memorial to Wellington, of a more appropriate size, which still stands outside Apsley House (and can be seen in the 1902 postcard, above left). In 1891 the Prince of Wales suggested Adrian Jones be commissioned to sculpt a Quadriga for the arch, as Decimus Burton had originally intended. At that time Jones was a young sculptor at the beginning of his career, and though the Prince admired his work, Jones had no other influential friends, and so had to prove himself and build a reputation in order to win the commission. In 1895 he was commissioned to sculpt the horse Persimmon at the Royal Stud Sandringham (which we also conserved in 2003), and he also gained several other commissions for large-scale bronzes. Finally, in 1907 monies were found and Jones produced a model, which was approved. He began modelling the full-scale version in 1908. Edward VII continued to support Jones and used to visit the studio, but sadly he died before it was finished. The Quadriga was finally erected in 1912 but, without the enthusiastic support of Edward VII, there was no grand unveiling and no reference to the artist’s name on any plaque until it was added to the existing dedication plaque in 1921.